A post in which Stephany uses popular “historical” films to teach kids a little history. In today’s lesson, we are going to start in ancient times with the foundation of Western civilization in Greece. Now Greece was filled with a bunch of Spartans that yelled a lot, kicked people down wells and never wore long sleeves. It should also be noted that ancient Greeks had 4% body fat and no body hair. Except facial — beards were super cool in ancient Greece. Now King Leonidas of the Spartans had the best beard and abs, but he wasn’t very popular. King Leonidas could only get 300 of his totally ripped buddies to help him fight thousands of equally ripped guys in the historical Battle of Thermopylae. Said battle was long, hard, sweaty, bloody and muscular. 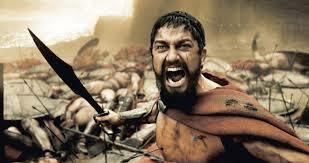 In the end, King Leonidas should have recruited more dudes, because he died in battle. However, King Leonidas’ six-pack-abs went on to inspire future generations of Greeks and American presidents, including Abraham Lincoln. President Abraham Lincoln definitely studied his Greek history, because he spent his youth getting totally ripped, and practicing his sweet martial arts moves with an axe. He also had a beard, because beards were still cool in the late 19th century, which is a blessing because everything else was kind of crappy. The 1800’s were a tough time in America. The West was being settled by lawman in masks with vaguely Native American sidekicks with too much makeup, and the North and South were reaching a point of major conflict because of vampires. See kids, the vampires in the South wanted slavery to remain legal because they lived off the blood of their slaves. Abraham Lincoln thought this was very wrong. He didn’t care so much about the ethics of one human being owning another, he cared about fighting vampires with his axe. Unfortunately, all this vampire stuff eventually led to the Civil War. And thank goodness there was an axe-wielding maniac leading the country at that time, or America might not be what it is today. Which brings us to our next generation-defining conflict, known as World War II. In World War II, the Americans were fighting the Nazis. Luckily, the Nazis only cared about making movies, and they were super excited to attend a film premiere. An angry French woman owned the theater, and during the film premiere she helped to assassinate Hitler and the entire Nazi Party leadership. You’d be a Nazi right now, if it hadn’t been for an angry French lady and the Nazi’s love of cinema. Thank goodness for movies, right? Now kids, we can’t discuss American history without touching on what happened in 2001. In 2001, we found a black monolith from an extraterrestrial intelligence hidden on the surface of the moon. There were also monkeys, space babies and an evil computer that sang songs. 2001 was crazy, which is probably why we got rid of all that advanced technology. Without our advanced technology, we had no way to stop New Orleans from being flooded by Hurricane Katrina. Not only did those poor people have to deal with flooded homes, but there were giant pigs trampling on all the trees, making their way across the land. Fortunately, a little girl that lived in a place known as the Bath Tub took a page from the ancient Greeks. She didn’t have a beard, but screamed a whole lot at the giant pigs and they went away. Yay, history. Which brings us to present day, kids. So right now, there is a plague that’s causing the dead to rise. Yes, the worldwide zombie war is just getting started. Don’t you wish we hadn’t gotten rid of all that technology in 2001? I’d hate to be a kid today. This entry was posted in Film, Humor and tagged 2001, 300, Abraham Lincoln Vampire Hunter, Beasts of the Southern Wild, film, history, humor, Inglorious Basterds, Stephany Folsom, StephanySays, World War Z, zombies. Bookmark the permalink.